Type 2 routes are used to advertise MAC addresses and IP addresses that might be associated with aforementioned MAC addresses. 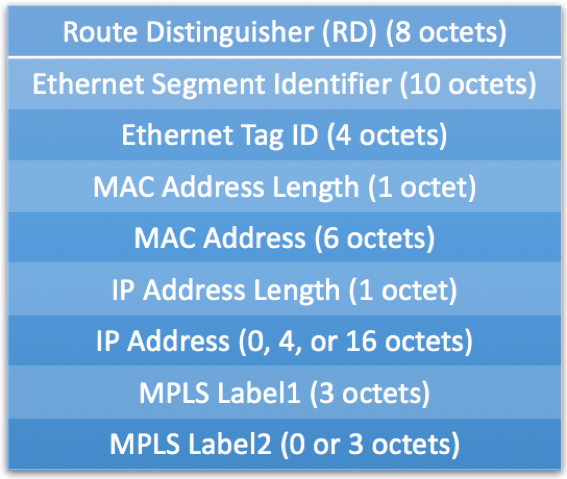 In order to advertise Type 2 routes, PE needs to learn MAC addresses from the directly attached CEs. This is done via normal data-plane learning mechanisms. RFC 7432 also allows for MAC address learning via control plane interaction between PE and CE, although we have not see this implemented by any vendors. Type 2 route format is shown below. Route Distinguisher, ESI, Ethernet TAG ID and MAC information are mandatory. IP Address field is optional and is set to zero by default. This field might be populated if PE is aware of an IP address associated with a given MAC address. This is used in proxy ARP scenarios, where remote PE will respond to an ARP request received from a CE attached to that PE. MPLS Label1 field is mandatory downstream-assigned Label associated with the MAC address being advertised by a PE. This label is used to forward packets toward the CE. Please refer to EVPN Terminology document if you are not familiar with above terms.